This is how I made 8645, a Solaris-inspired image. I don’t know why I’m being so sci-fi oriented lately. We had another article with space influences just a few weeks ago. This time I intend to be pragmatic, so I am turning my space idyll into a tutorial. Perhaps you were going to have ice-cream and you don’t want to waste your time on it. After all, who cares about Stanislaw Lem? He’s dead. And if he weren’t, he wouldn’t be happy about his involvement in this at all. But even if you have never read anything by Lem, you could still find this tutorial useful, so read on. Selecting the right images for a project like this is essential. I will use these two photos taken in very different circumstances and at very different times as the core of my final work. 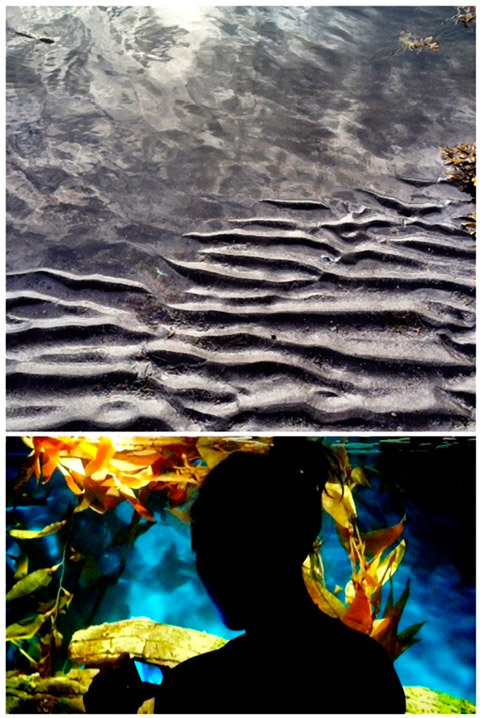 One is a shot I took on the beach in Reykjavik in the spring of 2012; the other is the silhouette of a lady taking a picture at the Lisbon Oceanarium about one year later. I keep most of my shots, even if I don’t use them immediately, as I know that in all probability they will become “something” sooner or later. 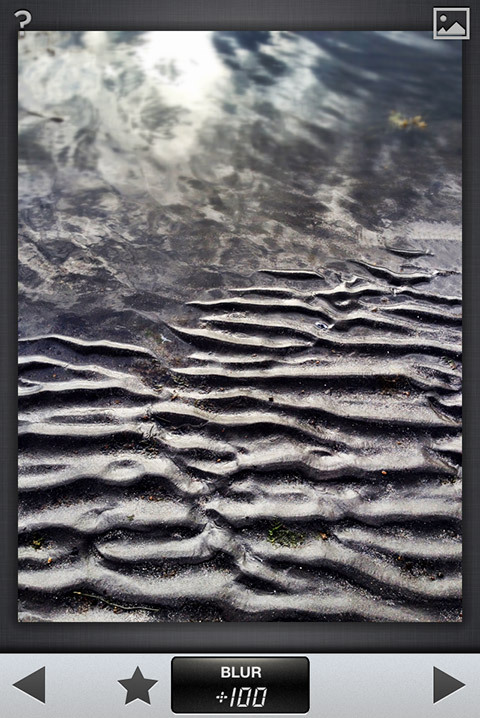 In this case, the first image was taken with Camera+, the second with Kitcam. Since Kitcam was discontinued and I like Camera+ for its functional features (such as separate controls for focus and exposure), I suggest using the latter for the shooting part of your projects (or, if you prefer, an equivalent like ProCamera). This will look like a long process, but it was actually a quick edit—even though it took me some time to figure what I wanted to do in detail the first time around. Besides these two shots, I only used effects and textures coming from the various apps. I want to use the image of the beach as the background. But before I do, there are seaweeds around the borders that I need to remove. I open the image in Handy Photo. I go to the Hand icon on the top right corner to open the menu. From it, I select Retouch (the brush icon) and with the brush I paint over what I want to remove. 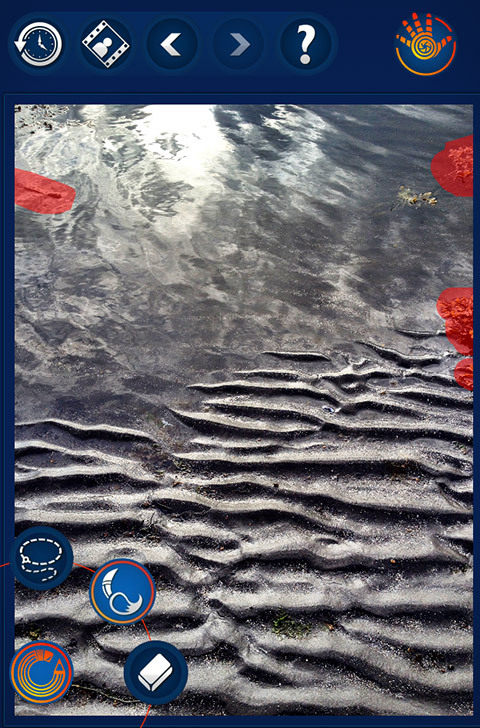 I tap once on the screen when I am done selecting the seaweeds and wait for the app to process the image. I save. 01 - Cleaning up with Retouch tools in Handy Photo. I open the retouched beach shot in Snapseed and go to Tilt-Shift. My purpose is to blur quickly the upper part of the image as the reflections on the water are too harsh. I move the linear blur controls so that only the upper area will be blurred. I raise the Blur amount to the maximum and decrease value of transition slightly. I also decrease contrast. I apply the changes and save. 02 - Adding some blur. 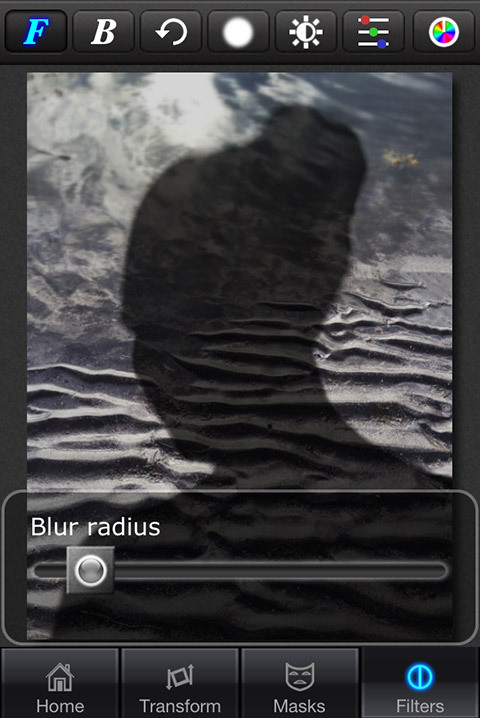 I launch Superimpose and load the edited beach photo as background and the lady photo as foreground. In the Transform panel, I position the foreground as I like, I set blend mode to Hard Light and lower opacity by 25%. I don’t need anything else than the woman’s head and body in silhouette for my foreground, so I move to the Masks panel and with a medium sized brush with a 100% smoothness I start erasing everything I don’t need. I resize the brush as I work to make sure I don’t alter the shape of the silhouette (but I brush away some imperfections, such as the messy hair of the lady). 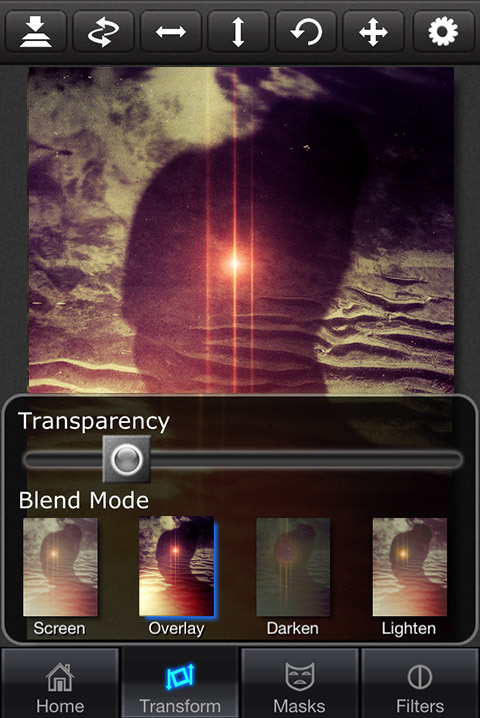 In the Filters panel, I desaturate the image and apply to it a blur of around 10. I save the composite. 03 - Merging two exposures. I open the composite in Snapseed. I want to give it some visual ambiance without overdoing it. I use one of the app’s Retrolux effects, with some adjustments. I select Style 6, with Soft 2 texture and Soft 2 light leak. I push the leak button a few times to have the light appear on the lower left corner. I do the same with the texture to position the scratches as I like and add some depth in the shadows. 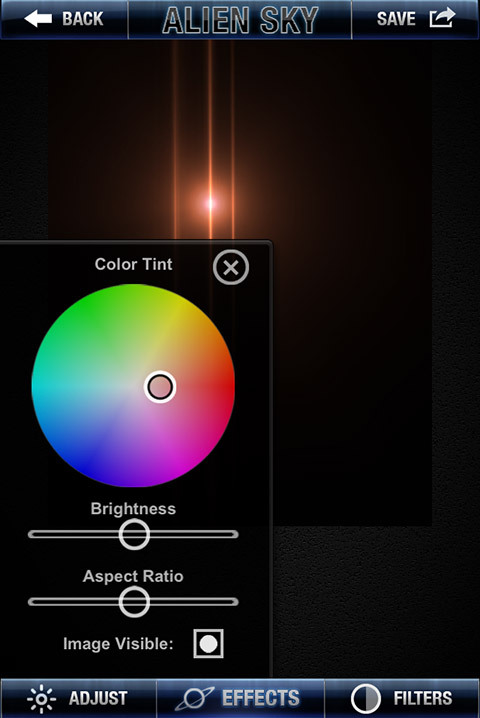 To enhance the mood, I lower brightness and contrast and increase values for all the rest. I save the result when I’m done. I load a black image file into Alien Sky. I usually keep black and white files ready for use in case I need to apply effects freely, like when apps ask me to resize or crop the originals significantly. Some other times I simply find it harder to adjust specific effects as I wish in a given app than doing it on a blank image and then merging in another app where I can try different blend modes and make other changes. 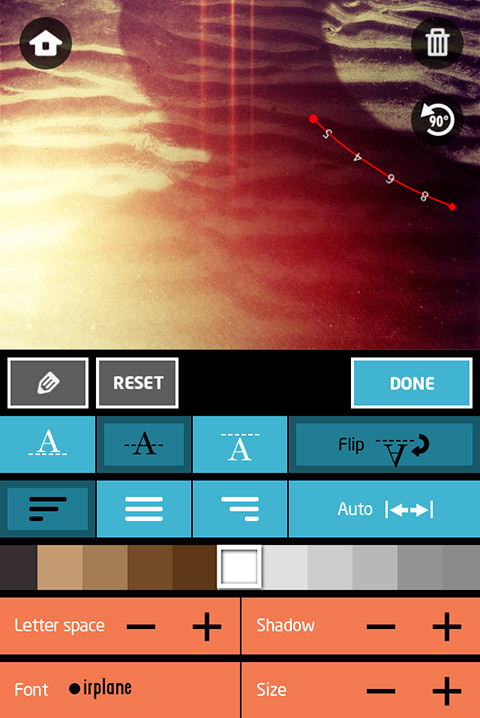 From Alien Sky’s effects list I select the Proton Streaks, alter hue a little and save. 05 - Light effects in Alien Sky. Back to Superimpose, I open the image processed in step 4 with Snapseed as a background and the Alien Sky light effect as a foreground. I go to the Transform panel to move and resize the light layer so that the effect’s core is around the central area of the silhouette’s head and change its mode to Overlay, lowering opacity slightly. 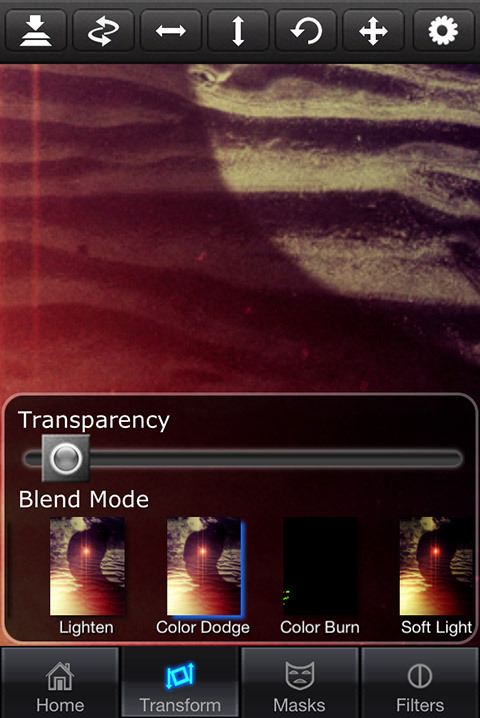 The change of blend mode will enhance contrast as well. I flatten and save. 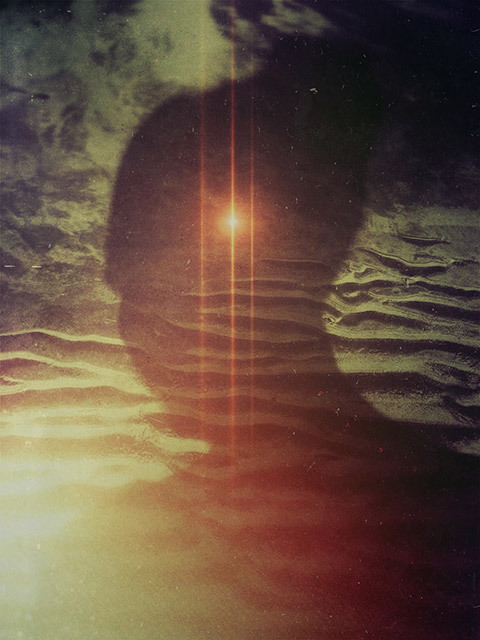 06 - Adding a light effect with Superimpose. I open the image I have so far in Path On. 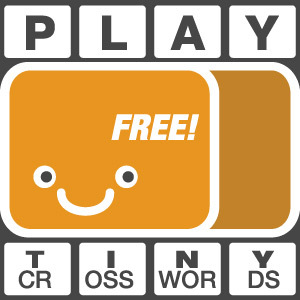 I draw a short curve on the back of the silhouette and type in white a few numbers, “8645”. In the Edit panel, I choose the Airplane font. I flip the text and change the alignment to the middle option. I also decrease size and increase letter spacing. My purpose is to make the type barely noticeable in the final image. In the Backdrop panel I lower the picture’s opacity to total black. I save the text file. 07 - Shaping text with Path On. Back again to Superimpose, where I still have my flattened picture open (if I don’t, I can choose Reload as soon as the app starts). I load the small numbers as a foreground layer and use the Scale Fit tool from the Transform panel to position it automatically where it belongs. I change the type’s blend mode to Color Dodge and lower opacity very slightly to make the effect a little subtler. I save the result. 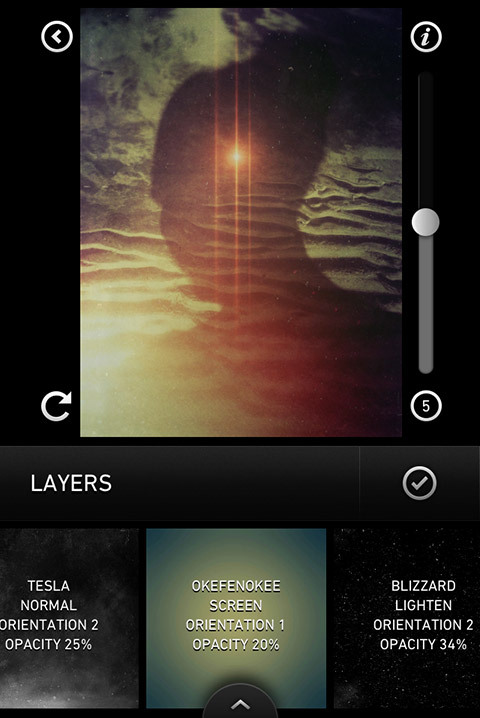 08 - Merging image and type in Superimpose. Layer 4 – Okefenokee, Overlay, Orientation 1, Opacity 32%. 09 - Final touches in Mextures. I save the image when I like what I see in preview. As you know, this is the result. We can both have our sci-fi ice-cream now. One doesn’t have to stick to the “literal” reading of a photo to put it to good use. Trying out different combinations of images and effects can generate very surprising developments sometimes, even if it can take some time to acknowledge it. Anything around you and each and every photo you take can spark new ideas. The image above is the result of discussing sci-fi books randomly. With a friend we were talking about Stanislaw Lem and I had to admit I am not a great fan of his work. I recognized the power of Lem’s ideas, but I also rejected the feebleness of his execution. In his most famous work, Lem has truly mesmerizing passages about the planet Solaris that are definitely worth most sci-fi books twice over. At the same time, Solaris lacks force and coherent character development and I remember while reading the book I was mad at the main characters and bored with the story; I even dropped my copy in the bathtub a couple of times because I couldn’t keep my eyes open. Years after reading it, I realized that I have forgotten all about the boredom, the irritating characters and the many deficiencies of the plot, or at any rate most of it. I now remember a few impressions, coming mainly from the otherwordly atmosphere of pages where characters and story were irrelevant. 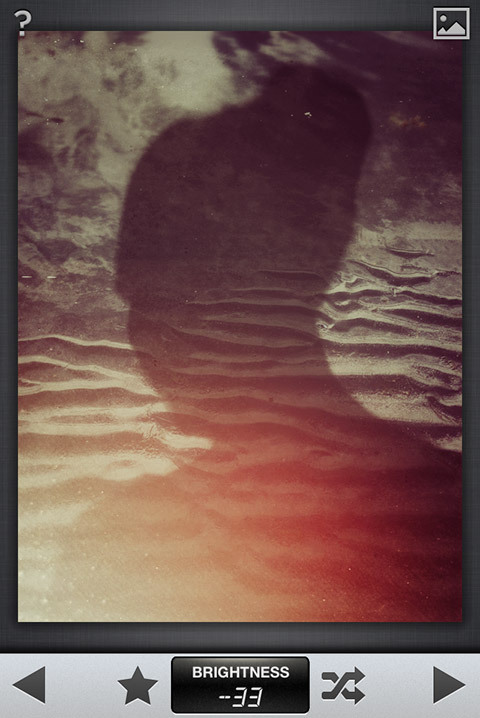 What’s this HandyPhoto? Never heard about it, but looks useful! Will check it!